I was craving some crunchy shrimp, so I bought a box of shrimp tempura mix from the grocery store with the intention of using panko bread crumbs to make it even crispier. 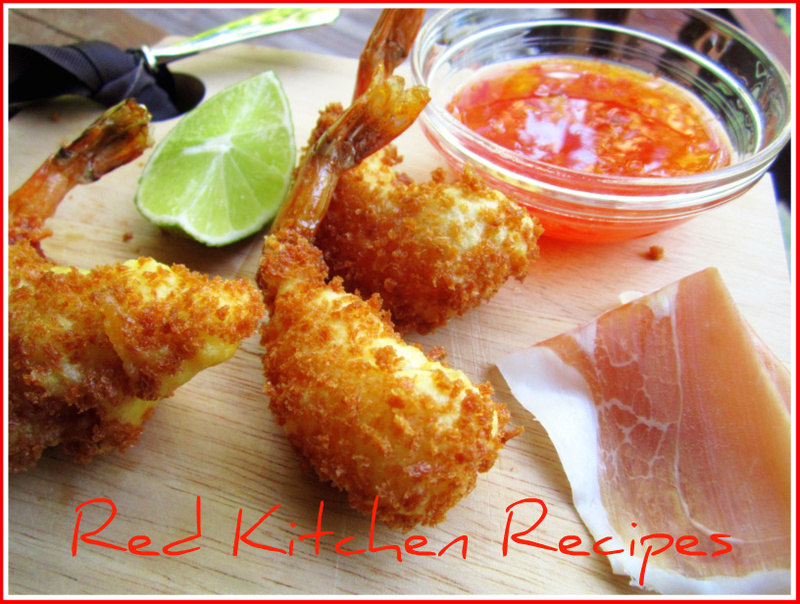 Then I thought about what it would be like to wrap the shrimp in prosciutto before I battered it, then fried it. I can tell you this. I loved it! But after this experiement, I 've decided that I better go back to lean proteins and steamed veggies! Our neighborhood pool opens next Saturday!! The thing that I offer to you on my blog is the knowledge base that I've gained from my countless hours of research on other web sites and other cookbooks, especially those belonging to renowned celebrity chefs. I'm a bit obsessed with their techniques and overall knowledge. I haven't been classically trained in a culinary school, but I've read the cookbooks of almost all of the Iron Chefs from Michael Symon to Bobby Flay to Morimoto himself. One of the things I've learned about deep frying (perhaps a Paula Deen cookbook?) not sure where, but in many of the books, the temperature needs to stay at about 350 degrees. When my husband Jereme cooks on our gas range, he turns the heat up and down constantly to maintain the temperature he needs to cook food throughout without burning the outside before the inside is cooked. In my first endeavor to deep fry since I last burned something in my early twenties, I decided to use an electric skillet that has the temperature control built in. It worked beautifully! The shrimp are delicious eaten alone or with a sweet chili sauce. Kroger Marketplace offers three or four different brands of the sauce. You can also find the sauce at Whole Foods and The Fresh Market. Can you tell I'm a West Little Rock Foodie? I also experimented with just coating the shrimp in egg and then panko. They were actually just as good, and cutting out the tempura step actually made it less of a hassle. Prepare the tempura batter per package instructions. Heat an electric skillet with one to two inches of oil to 350 degrees. Wrap one slice of prosciutto around a piece of shrimp. Dip into the tempura batter then into the panko then into the pan. You can fit about 5 pieces in the pan at a time to leave enough room around each piece. To make the shrimp without the prosciutto or tempura, you can dredge the entire piece of shrimp in flour. This helps prevent splattering! Then dip into a dish of beaten egg, then coat with panko. Then go back to step 5 and 6.